The Novastep GFAS 2019 – Annecy Edition will be held at the exclusive The Congress Centre at the Imperial Palace in Annecy, France. The GFAS room blocks at the Imperial Palace Hotel and Catalpa Hotel are expected to fill quickly, please make your reservations early. Once the room block is filled the rooms will be at prevailing rates. The GFAS room block reservation deadline is Friday, March 1, 2019. Room rate prices will increase after March 1, 2019. GFAS Faculty: Please note, your room reservations will be processed by the Novastep GFAS 2019 Program Office on your behalf. – The Palais de l’Ile, also called the “old prison”, was built on an island in the river in the 12th century. The Palais de l’Ile was a court house and a prison and inside you can see the former prison cells and visit an exhibitition on the architecure and heritage. It is the symbol of the town and is among the most photographed monuments in all of France. – The Château d’Annecy (Annecy Castle) was the home of the Counts of Geneva. In the 16th century the castle entrance was fortified with a parapet walkway. The oldest part of the castle is the Tour de la Reine which was built in the 13th century. From the 17th century to the 1940s it was a barracks and today it houses a museum with exhibitions of Art and History of the area. – The Cathedral of Saint-Pierre built in the 16th century was the cathedral of François de Sales, and is home to a number of artworks and baroque pieces from the 19th century. Outside the cathedral, the 16th century Hotel Lambert was home to Francis de Sales (bishop of Geneva from 1601-1622). – The bishop’s palace, which adjoins the cathedral, was built in the 18th century. Walk over the bridge to the garden of the bishop’s palace and along the Quai Madame de Warens to the Rue de la Republique. – The Porte Sainte-Claire gate is one of the gateways into the town and next to it is the Gallo House which has an 18th century facade. From here you can take the Pass. Nemours which climbs steeply to the castle. – Another religious monument is the church of Saint-Maurice which has a flamboyant Gothic style of the 15th century, and houses some very interesting paintings from the 15th and 16th centuries. From the Pont de la Republique you have a lovely view over the Thiou river. The Thiou is one of the shortest rivers in Europe. It is just 3.5 km long, most of which is in the canals running through Annecy making it such a beautiful city – the ‘Venice of the Alps’. 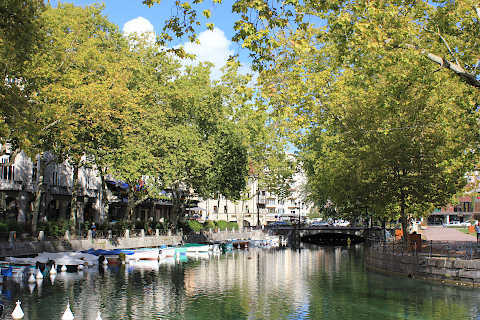 When you have explored Annecy take the Quai Napoleon III to the Jardins de l’ Europe. These landscaped gardens date back to 1863 and are a pleasant place to relax. From here cross the delightful Pont des Amours (Lovers’ Bridge). This delicate-looking iron bridge was constructed in 1907. 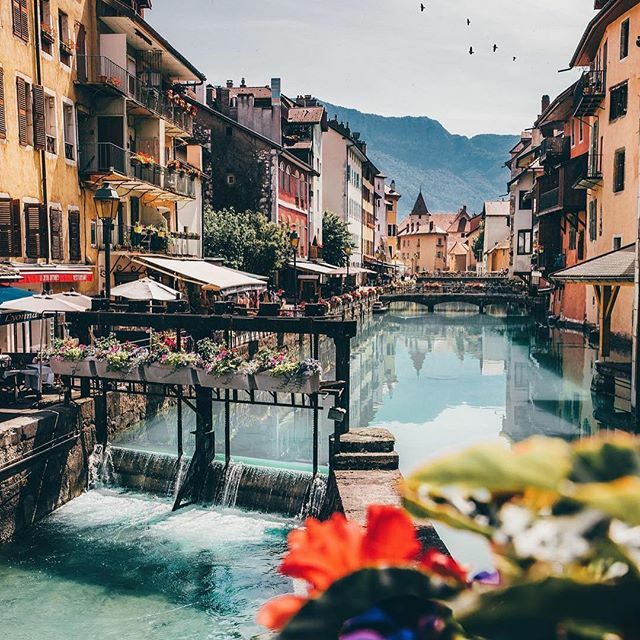 Located just 25 miles (40 km) to the south of Geneva, Switzerland in the southeast region of France, Annecy can be easily accessed from around the world. From your point of origin, there are several possibilities to reach Annecy. If arriving by airplane, the most convenient way is to arrive in Geneva International Airport, (GVA). Annecy is also accessible from either Paris or Lyon via TGV Train. Personalized transfer directly through LIGNE DIRECTE (www.ligne-directe.com). The driver will pick you up at the exit of the terminal and will drive you to your hotel. Cars can be rented from Europcar (www.europcar.com), Avis (www.avis.com), Rent a Car (www.rentacar.fr) or Hertz (www.hertz.com). From PARIS, the train would be the cheapest and most convenient way to arrive in Annecy. The price of a round-trip ticket is approximately €115. From LYON, the train would be the cheapest and most convenient way to arrive in Annecy. The price of a round-trip ticket is approximately €60.